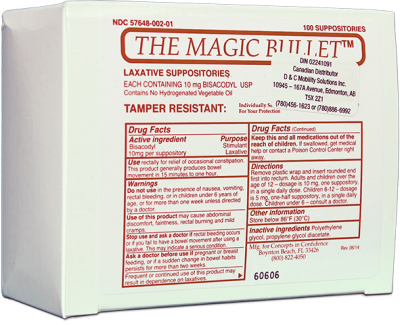 The Magic Bullet ™ is a better alternative to other suppositories, as it is faster acting, safe and sure 10 mg Bisacodyl suppository. It is designed to help those with bowel incontinence to minimize the cost and excessive time involved in most bowel programs. It is water based, not oil based as other suppositories, which causes the Bisacodyl to totally disperse within minutes after insertion. The Magic Bullet ™ is currently approved by Alberta Blue Cross, Workers’ Compensation Board, and Motor Vehicle Accident Claims.